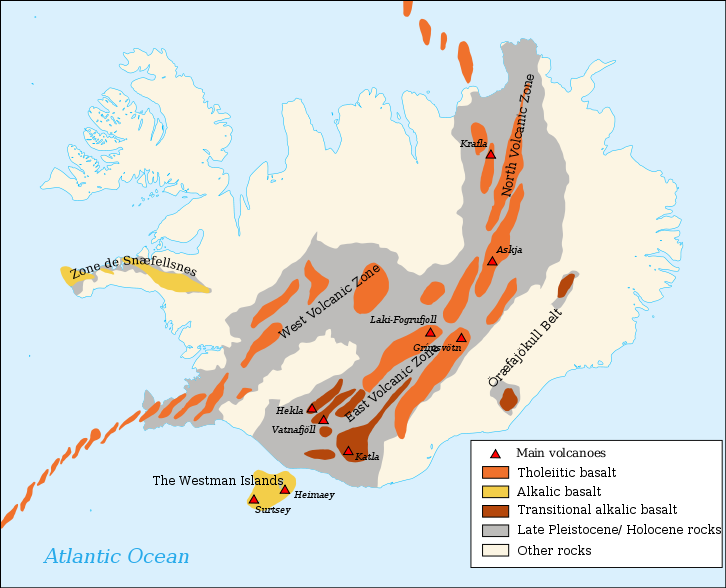 Iceland is very seismically active and has numerous volcanoes and it looks like another eruption could occur anytime. ﻿﻿﻿The Eyjafjallajokoll volcano that erupted last year created havoc and some great conspiracy. Air travel was interrupted grounding airplanes all over Europe. The stoppage was supposedly due to silica in the ash possibly clogging the engines; even though airplanes fly sand storms in Afghanistan and Iraq. We thought we found a face on the surface. Hard to imagine a scientist that doesn’t blame global warming isn’t it? One thing we learned more about from the Eyjafjallajökull eruption is that there seems to be a connection between earthquake swarms and eruptions. We wouldn’t have thought it to be rocket science, just rock science. When adding one and one you get two. When the earth shakes it makes sense that the likelihood of a fissure releasing volcanic ash and lava increases. The Volcanic System of Iceland runs the length of the country, pretty much right down the middle. Last year the great worry was that Katla, the big sister of Eyjafjallajokull was also going to erupt. This image from the Met office is from May 21, 2010 to give an indication of the rumblings underground. Katla did not errupt. On May 24, 2010 the eruption was declared over. https://ahrcanum.wordpress.com/2010/05/25/icelands-volcano-eruption-endstops/ It was also about the same time Scientists in China succeeded in teleporting information between photons further than ever before. They transported quantum information over a free space distance of 16 km (10 miles) A connection, an off switch? Of course we could always blame HAARP. Like a pregnancy, here we are 9 months later and mother nature looks like she is about to give birth to more eruptions in Iceland. The Icelandic Met Office has issued that there is no eruption about to start in Bárðarbunga volcano. News that claim that are wrong and remain that until proven otherwise. Presently, there are no signs of an imminent volcanic eruption in Iceland. The Icelandic Meteorological Office (IMO) did not issue a warning last weekend in connection with increased seismicity beneath the Vatnajökull ice-cap. If signs of an eruption were apparent, IMO would issue a warning immediately. A lot of earthquakes does not always mean that an eruption is immanent. It sometimes just means a lot of earthquakes and nothing more. Media dramatization does not chance this fact. Icelandic News on this. Use Google Translate at own risk. The folks at http://bigthink.com/ideas/26821 run an awesome site on volcanism worthy of a bookmark as well. Our money is on another eruption. Stayed tuned for more truth and conspiracy!